Having HR policies clearly communicated (yes household employers should have HR policies) keeps everyone on the same page when it matters most. Having everything in writing upfront can be vital if an employee sues you. With clear cut policies you are much more likely to avoid those issues. You may even want to have a lawyer take a look to make sure everything is correct. You can also use the handbook to help show that you take being an employer seriously and care about your employees’ wellbeing. Make sure to have any benefits being offered clearly stated, as well as time off policies. Employees tend to feel better about working for someone that is taking their employer responsibilities seriously. With employment law varying by state you need to be careful about “stealing” someone else’s handbook. There could be important differences that you get wrong, or it could just not be a very well written document making you look lazy. It is worth taking the time to create your own handbook and ensure it is correct. For household employers we have a Work Agreement Template you can use. As mentioned above, be careful about your state’s specific laws and how they are written in your work agreement. 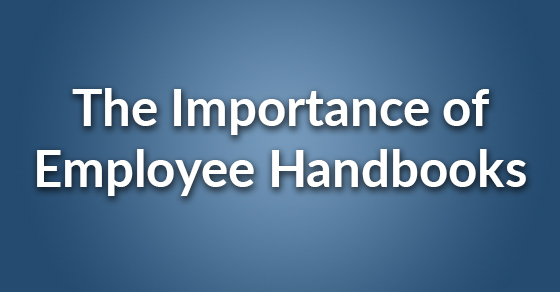 We hope we were able to help you understand the importance of updating your employee handbook.